For discussion and announcements of soundware - patches, presets, soundsets, soundbanks, loop libraries, construction kits, MIDI libraries, etc. 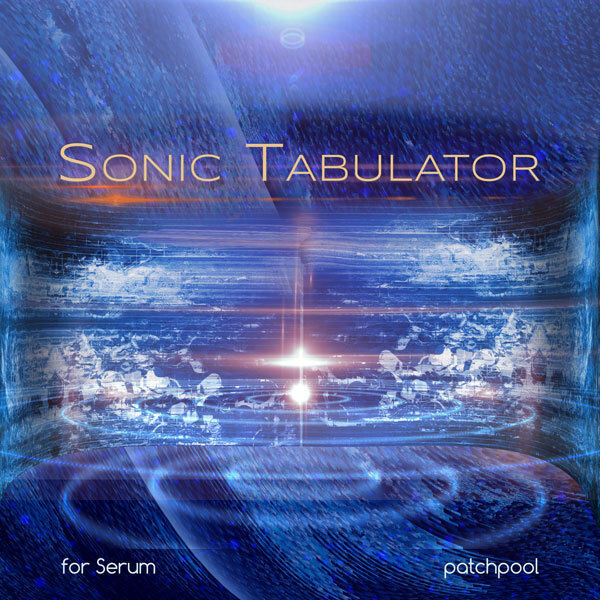 Sonic Tabulator for Serum contains 101 patches including 1 variation covering a wide range of atmospheric sounds, warm pads, huge drones, tinkling bells, snappy plucks, expressive leads and resynthesized instruments, other worldy noises and animated sequences. Cold digitalness and darker soundworlds unite with warm, emotionally appealing sonic goodness. All waveforms in this set are new and fresh, often created by using samples from acoustic instruments from the gigantic pool of patchpool samples as sound sources for the generation of wavetables. Depending on the amount of slots in Serum's modulation matrix, each patch has up to 4 Macros and the Modwheel assigned, many also use Aftertouch. As Serum also allows for sample playback in it's noise oscillator, a folder with 26 wav samples (44.1 Khz/24 and 16 Bit/stereo) is also included in this library. You can view/download the PDF for this set including the licence agreement, more info and a detalled patchlist here. Order Sonic Tabulator for € 28 EUR on the product page. All demos were produced entirely with Serum using only patches from Sonic Tabulator, no post-processing was applied apart from a limiter on the outputs and some volume automation, if several instances of Serum were used in a track. More videos for Sonic Tabulator can be found in this youtube playlist. Last edited by Sampleconstruct on Thu Oct 30, 2014 6:08 am, edited 7 times in total. This patch uses a female horror scream sample in the Noise Oscillator, Osc 1 plays a wavetable generated from a sustained soprano sax note. The Modwheel controls the phase of the Noise Osc, so you can basically scroll through/scratch the sample. Then there is tuned combfiltering, ring modulation filter and other stuff, most things controllable via the 4 Macros. Sampleconstruct wrote: This patch uses a female horror scream sample in the Noise Oscillator, Osc 1 plays a wavetable generated from a sustained soprano sax note. The Modwheel controls the phase of the Noise Osc, so you can basically scroll through/scratch the sample. Then there is tuned combfiltering, ring modulation filter and other stuff, most things controllable via the 4 Macros. A nice, soothing ambient patch, that. If it were easy, anybody could do it! Spitfire31 wrote: A nice, soothing ambient patch, that. I see - my soul always had all sorts of shades, that's why I love both light and new-agey sounds as well as dark and brooding stuff and everything in between. The filters in Serum are truly dangerous, here is temposynced patch named Monster Groove combining a vocal gibberish sample in the Noise Oscillator with a vocal wavetable and filter mayhem. Serum seems to take it's path, thank's for getting on board! EDIT: details: Lead sound, wavetable generated from an imported alto flute tremolo, removed the breathing/air waveforms (resynthesizing air and hiss hardly ever works), morphed between the remaining ones, x-faded the edges. Aftertouch for vibrato, some effects and wavetable/warp modulation via an untriggered LFO, filter cutoff (german filter) assigned to velocity, the wheel also shifts the wavetable position to the end of the table where it sounds more edgy.